Monitors like "Shkval", tower gunboats of the type "Shkval" - a series of Russian tower gunboats, and later Soviet monitors that served as part of the Amur military flotilla. 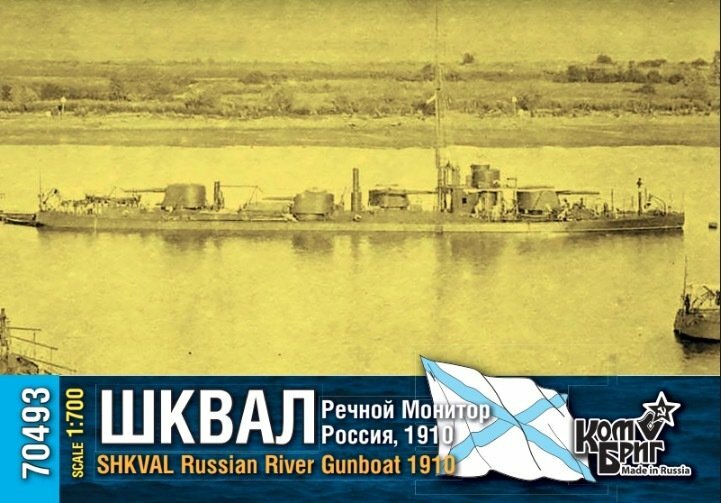 Prior to the October Revolution, the tower gunboats of the Shkval type were also called river gunboats of the 2nd rank (tower). Tower gunboats of the Shkval type were the world's first armored river ships with diesel engines, as well as the most powerful ships on the Amur. One of the tower gunboats of this type "Groza" was lost during the Civil War. In 1907, the Marine Ministry of the Russian Empire ordered the construction of eight armored gunboat towers of 976 tons displacement for the newly created flotilla, which was formed to protect the mouth of the Amur River and the shallows of the shallow Tatar Strait. Before the designers of the tower gunboats there were very strict conditions: the draft should not be higher than 1,2-1,4 m, the fuel stock should be enough to go from Khabarovsk to Blagoveshchensk and back and on the cannons required to install long-range guns of large caliber, armor, which provided protection from the fire of field guns and provide a speed of at least 10 knots (18.5 km / h). When designing, we found out that all these requirements can be met only if you install diesel engines on gunboats . The ships finally became part of the Amur River Flotilla in the navigation of 1910. Tower type gunboats of the Shkval type, equipped with modern (at that time) large-caliber artillery systems, with diesel engines with a capacity of 1,000 horsepower, and a range of up to 3,000 miles, proved to be the best in the world river warships for that period. During the First World War, taking into account the calm military and political situation in the Russian Far East and the need to strengthen the fleets operating at the European Theater of Military Operations, the Marine General Staff ordered the withdrawal of some of the ships. From them, artillery, partially ship machinery and mechanisms were removed. Since August 1914 only "Squall" and "Tornado" remained in the ranks. In the late 20's - 30's were reclassified to monitors, were overhauled and upgraded. During the Second World War, the ships (except for the monitor "Kirov") participated in the fighting on the river Sungari. Monitors "Sverdlov" and "Sun-Yat-Sen" were awarded the Guards title. In March 1958, all monitors of the "Shkval" type were handed over to the stock property department for dismantling for scrap metal.